Looking for the home page with modern styles? Click here. Virtual RETRO Hair Designs: what was big before is now big again. The great looks of the past have returned! Be a 1940s movie star -- or try the "pin-up girl" rolled bangs look! These retro-vintage hairstyles start with the Roaring 20s and continue through the decades, recapturing the times when families gathered 'round the gramaphone, drank armored heifer, enjoyed silent movies, or dropped a dime into tabletop jukeboxes in chrome-plated malt shops. There were dames & vamps, carhops on roller skates, the poodle skirts & saddle oxfords, little deuce coupes, lava lamps, and of course, people in motion. Relive it all as you try on these unforgettable virtual classic hair styles! 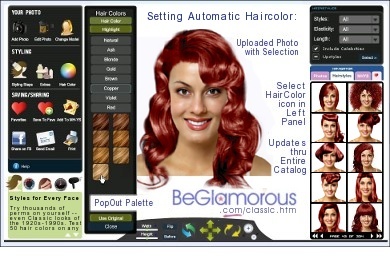 The hair color palette can even be used to pre-set highlight colors on perm selections. Mouse over any gallery thumbnail to see the original photo plus information. Remember that the Hairstyle Selector's array of designs is enormous -- with not only the latest looks, but also the "classic" selection of over 190 styles (pictured above is a 1942 Hollywood cascades design). It's just part of the gigantic variety of 4000+ choices you can test on your own photo. The Hairstyle Selector is easy to use. It's for any occasion, any age, any lifestyle, any facial shape! There's even a wizard mode that helps you find the best hairstyles for your face, as well as the best hair colors (see all features plus Q&A here) -- and a whole category of styles & haircuts for MEN, too! When you've completed your look, you can save, share or print the final result (your private gallery of saved looks will build up fast). If you need help or have questions, just click the "Help" button -- or, customer service is ready to assist! Have fun, upload your picture and try retro-vintage hairstyles on yourself now!